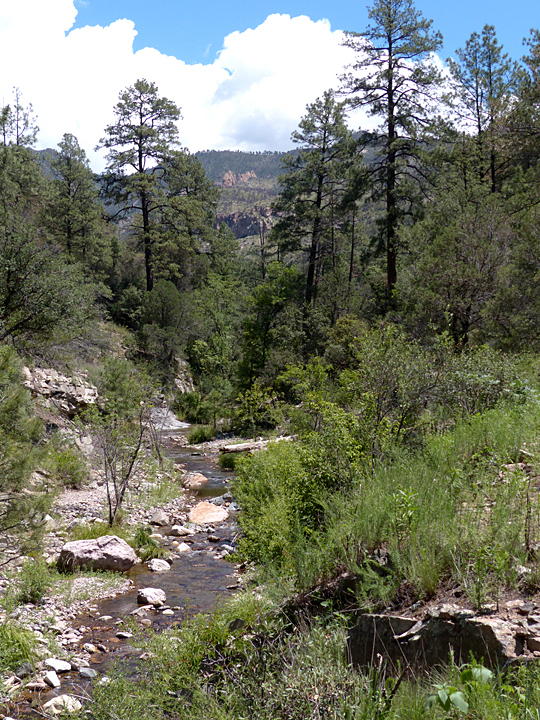 The Gila Wilderness was designated and set aside as the first Wilderness Area in the U.S. Forest Service system on June 3, 1924. This important achievement in conservation policy was largely the result of the continuing efforts of Aldo Leopold, one of America’s great naturalists and conservationists, who at the time worked with the National Forest Service in New Mexico and Arizona. Situated in Southwest New Mexico, this wild, extremely rugged landscape retains an amazing natural and cultural history – from its fiery creation from super-volcanoes 34 and 28 million years ago, to its initial use for hunting and foraging by the Southwest Archaic Culture, to later habitation by the ancient Mogollon Culture and the more recent Apache Culture, to pioneer settlers and miners in the late 1800s. Many people upon hearing of the legendary rugged, pristine beauty and history of the Gila Wilderness in Southwest New Mexico are intrigued, but typically put off visiting because they think that it would require several days of strenuous hiking, camping, or extended pack trips by horse to do so. Actually, this is not the case as there are numerous short, day-hike trails of easy to moderate difficulty, especially on the southwest side of the Wilderness, which will allow the time-challenged or physically-challenged visitor to experience the unique essence of the Gila while providing enticing magnificent vistas of some of the highest and most rugged interior portions of this incredible landscape. One of the best of these trails is the Rain Creek Trail, Gila National Forest Trail 189, which has an easily accessed trailhead located just 22 miles from Casitas de Gila Guesthouses. Depending upon one’s ambition and physical condition, two easy to moderate day-trip destinations and a third more strenuous option are possible day hikes on the Rain Creek Trail. The first hike is a two-mile round trip from the trailhead. This hike slowly descends 400 feet along an easily-followed trail into Rain Creek Canyon to terminate at a lovely lunch and turn-around spot where the trail crosses Rain Creek. Numerous gorgeous vistas of the upper reaches of Rain Creek Canyon and the lofty Mogollon mountain peaks beyond are presented at intervals along the way. The second hiking option is a three-mile round trip that continues a little further up the canyon after crossing Rain Creek to a second great lunch spot at a small, level camping site on an old Creek terrace on the east edge of Rain Creek. 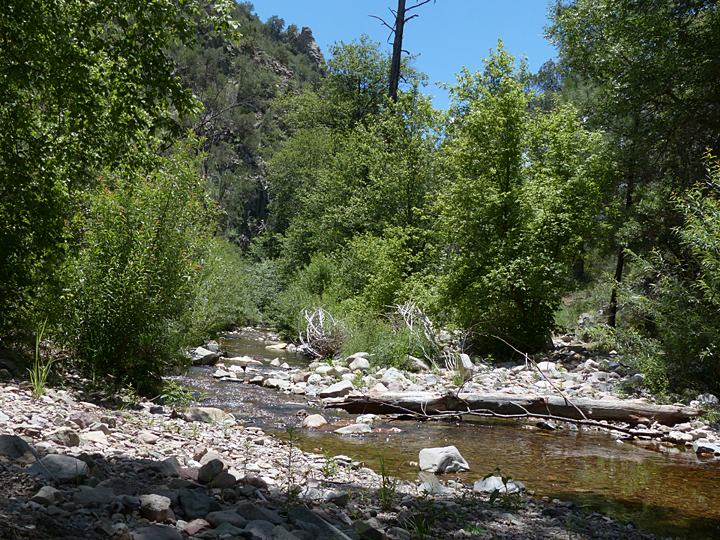 Here, one is offered a marvelous upstream view into the Gila Wilderness interior. If it is a hot day, and one feels the need to cool off, a short off-trail jaunt down the Creek will lead to a natural, smooth rock water slide emptying into a crystal clear pool! The third option is available for experienced hikers in good shape who aspire to high places and have lots of energy to spare after taking lunch at the second lunch spot on Rain Creek. 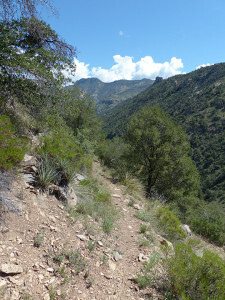 After continuing a short distance upstream from the second lunch spot, Rain Creek Trail begins an arduous, steep and rocky 850-foot ascent from Rain Creek to the east rim of the Canyon. This part of the trail is extremely rough, involves numerous switchbacks and covers a distance of approximately one mile. Some day hikers may not want to cover the full mile up to the rim of Rain Creek Canyon, especially when considering that the return hike out will require a one-mile ascent of 400 feet from the first lunch spot on Rain Creek to the trailhead. However, a short half-mile, 400-500 foot ascent hike towards the east rim of the Canyon will provide a marvelous view to the north of the cliff-lined upper reaches of Rain Creek Canyon and the soaring 10,000 foot peaks of the Mogollons beyond. 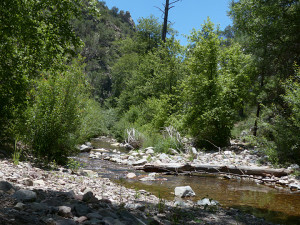 After reaching the east rim of Rain Creek Canyon, the Rain Creek trail continues on for approximately another three miles to a junction with the West Fork Mogollon Creek Trail, GNFT 224, on the West Fork of Mogollon Creek, before continuing another three miles east to its terminus and junction with the Mogollon Creek Trail, GNFT 153. But, of course, those are hikes for extended day and overnight excursions. 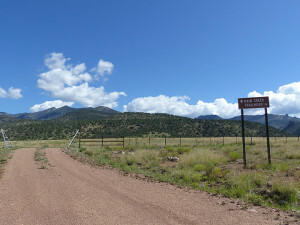 The drive northwest on U.S. 180 from the Gila River Bridge between the communities of Cliff and Gila to the Leopold Vista Overlook rest stop at theGrant County/Catron County border offers a spectacular view of the southwestern end of the Gila Wilderness within the Mogollon Mountain Range that parallels the highway some five to eight miles miles to the east. Lying between U.S. 180 and the fault-uplifted front of the mountains is the dominating landform known as Sacaton Mesa. Technically speaking, this landform is not a mesa, but is a classic example of a very large, cone shaped alluvial fan, composed of thick sequences of silt, sand, and gravel sediment that have been carried out of the mountains by the numerous streams that have drained this part of the Mogollon Range over the last several million years. The old Sacaton Road is a county-maintained gravel road which provides good year-around access to some of the best hiking trails in the southwest portion of the Gila Wilderness, such as Upper Little Dry Creek Trail, GNFT 180, Sacaton Creek Trail, and the Rain Creek Trail, except during rare periods of extended or extreme precipitation, when portions of the road can become quite muddy. Sacaton Road dates from pioneer days and runs close to the mountain front, parallel to and about seven miles east of U.S. 180 between the Gila River and communities of Cliff and Gila on its southern terminus and the Leopold Vista Overlook rest stop on U.S. 180 on the Grant County/Catron County border. 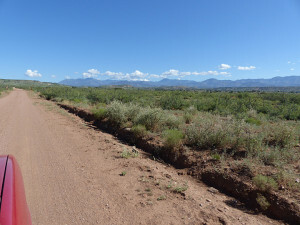 In all probability, Sacaton Road had its beginnings as an important foot trail created and used by the Mogollon Culture people over a thousand years ago to connect numerous small villages that were situated at intervals along the front of the Mogollons where major creeks flowed out onto Sacaton Mesa. Much later the Apache would have used these same trails in their seasonal comings and goings to and from the Gila Wilderness in their perennial pursuit of game, fish, and useful plants. With the coming of Anglo settlers and miners to Pinos Altos and the greater Grant County area in the1860s, Federal troops also used this route in pursuing the Apache, who, following raids on the settlers and miners, would use this ancient trail to escape to their lofty safe havens within the Gila Wilderness and the Mogollon Mountains. By the 1880s, large cattle ranches were being established throughout the Sacaton Mesa area by hardy pioneer families such as the Shelleys and the Rices. Stage coach routes soon operated regularly along what was now being called the Sacaton Road, connecting the mining towns of Cooney and Mogollon north of Glenwood with the prosperous and booming mining town of Silver City to the south. And, inevitably, in time, automobiles began to lurch and rattle over this venerable yet still rough-as-a-cob Sacaton Road. Traveling north on Sacaton Road one mile south of steep half-mile grade on road connecting the Low Mesa portion of Sacaton Mesa to the High Mesa portion of Sacaton Mesa. Site of the infamous Sacaton Mesa Run. Traveling north on Sacaton Road along High Mesa portion of Sacaton Mesa. Apex of Sacaton Mesa alluvial fan in center of photo at top of light green triangle against mountains. Sacaton Mesa consists of two parts: the High Mesa to the north and the Low Mesa to the south. Joining the two is a half-mile section of winding road which drops abruptly from the level surface of the High Mesa a vertical distance of some 200 feet down the steep side of a ridge to the near level surface of the Low Mesa below. It was here that a hair-raising and poorly-kept-secret sport soon developed, that while little known today, was, apparently, one the biggest local fun, yet highly competitive, things going at the time: The Sacaton Mesa Run! It was a brilliant July 20, 2015 morning as the two intrepid hikers set out from the trailhead kiosk marking the beginning of the Rain Creek Trail. Although caution signs warned of damage to the area by the Mogollon-Baldy Complex Fire of 2012, and stated that the trail was not maintained and difficult to find, such was not the case for the portion of the trail covered on this day. To the contrary, only minimal signs of fire were to be seen, and then only visible to a visitor familiar with the area. Likewise, the trail itself was in good shape, easy to follow with no difficult spots encountered. 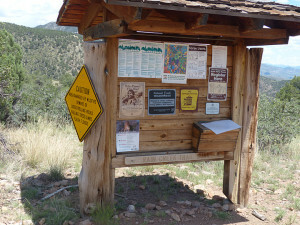 The Rain Creek Trailhead is situated at the very edge of the east side of the apex of the Sacaton Mesa alluvial fan at an elevation of 6,240 feet. Immediately after leaving the kiosk the trail heads east along a south-facing slope to soon cross a major fault zone, leaving behind the sedimentary alluvial silt, sand, and gravels of Sacaton Mesa with its characteristic vegetative abundance of Honey Mesquite (Prosopis glandulosa), to pass onto the layered volcanic bedrock deposits of rhyolite and andesite lava flows and pyroclastics, and the thick deposits of rhyolite welded tuffs that comprise the Mogollon Mountains. Once the trail begins to head north up Rain Creek Canyon, magnificent panoramas of the interior of the Wilderness greet one at every turn. Pinon Pine, Banana Yucca, Turpentine Bush, Beargrass, and Desert Scrub Oak line the trail. After initially heading east for about a third of a mile, the trail abruptly rounds the nose of a ridge to head northeast. 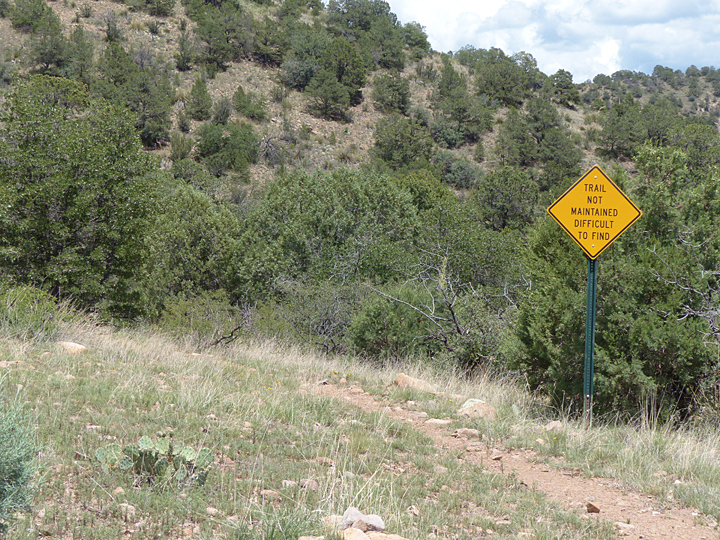 Here, a strategically placed wooden signpost announces the entrance into the Gila Wilderness, which is now spread out in a vast, magnificent panorama behind the sign. 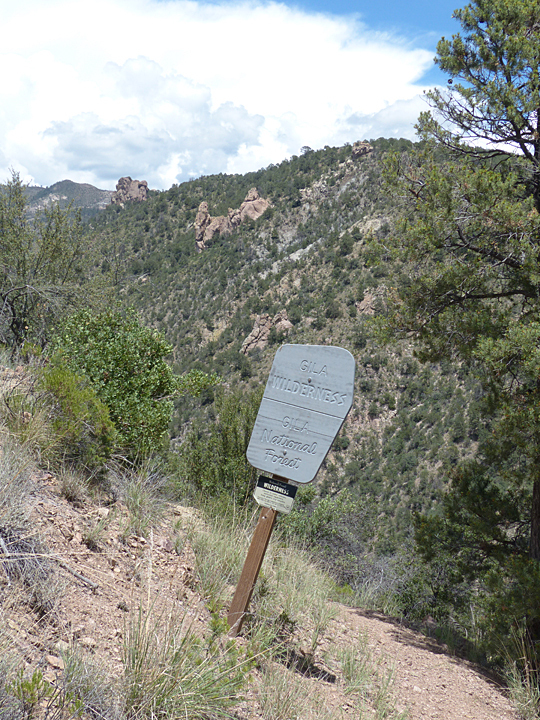 From this point on, the trail continues to head in a north-northeast direction, gradually descending 400 feet along the steep western side of Rain Creek Canyon to eventually intersect Rain Creek, one mile from the trailhead. 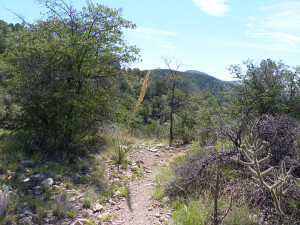 During this descent the trail passes through a typical Upper Chihuahuan Desert ecosystem dominated by scattered Piñon Pine (Pinus edulis), Alligator Juniper (Juniperus deppeana), and Desert Scrub Oak (Quercus turbinella), with intervening areas of scattered grasses, Turpentine Bush (Ericameria laricifolia), Cane Cholla Cactus (Cylindropuntia spinosior), Beargrass (Nolina microcarpa), Pancake Prickly Pear Cactus (Opuntia chlorotica), Banana Yucca (Yucca baccata), Sotol (Dasylirion wheeleri), and Parry’s Agave (Agave parryi). Hiking down towards the creek, many of the above plants were observed in various stages of flowering and putting out fruit. 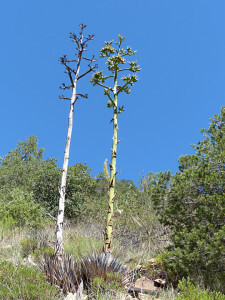 The Banana Yucca, which was noted as being in the flowering stage in the May 2015 Blog on the Sheridan Corral Trail, was now well past the time of flowering and fruiting, and the succulent fruits, if they had formed, had already been devoured by the animals and birds. Other plants, such as the Cane Cholla, Pancake Prickly Pear, and Parry’s Agave, had also already flowered and had recently developed fruit that had not yet begun to ripen. 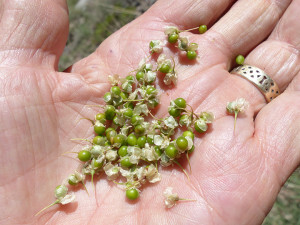 The Beargrass was mostly past flowering and many had fruit in the last stages of ripening. Some of the Sotol were still flowering. Beargrass berries are small, ranging from 1/8th to 3/16th of an inch in diameter, but they are extremely abundant, and easily stripped from the numerous three to four foot racemes growing from the crowns of the plants. 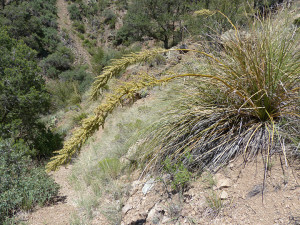 On this day, fruiting Beargrass plants were numerous along the the trail. A sampling of these berries confirmed what Native Americans have known for centuries: they are quite edible raw, and perhaps, over time, might even be considered tasty! 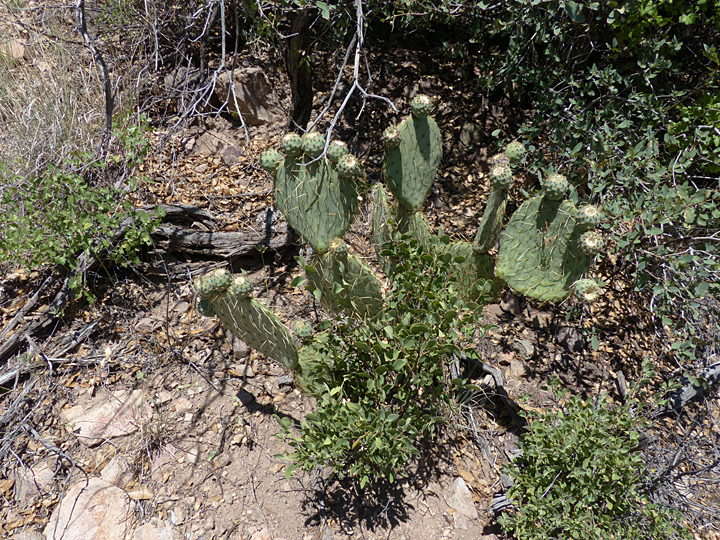 Ethnobotanical studies have shown that, with the exception of the Turpentine Bush (which was probably used for medicinal purposes), all of the above plants, including the Pinon Pine, Alligator Juniper, and Desert Scrub Oak, were used extensively as food by the Native American Indians in Southwest New Mexico, either in the form of flowers, fruits, seeds, roots, or stalks. In addition to food, many of these same plants were used for a variety of utilitarian purposes including basketry, clothing, medicine, cordage, dwelling construction materials, hunting and fishing equipment, weaponry, and sometimes ceremonial items. As is true for most plants in mountainous areas, each of the above plants have both a certain range in elevation in which they can grow and a variable timing of seasonal flowering, fruiting, and seed setting that is dependent upon temperature and moisture, which in turn is a function of both elevation and ground slope direction and exposure to the Sun. With a range in elevation of over 6,000 feet, the Gila Wilderness and the surrounding Gila National Forest is home to over 1,500 different species of plants, over 300 species of birds, over 80 species of mammals, over 40 species of reptiles, some 30 species of fish, and about 10 species of amphibians. 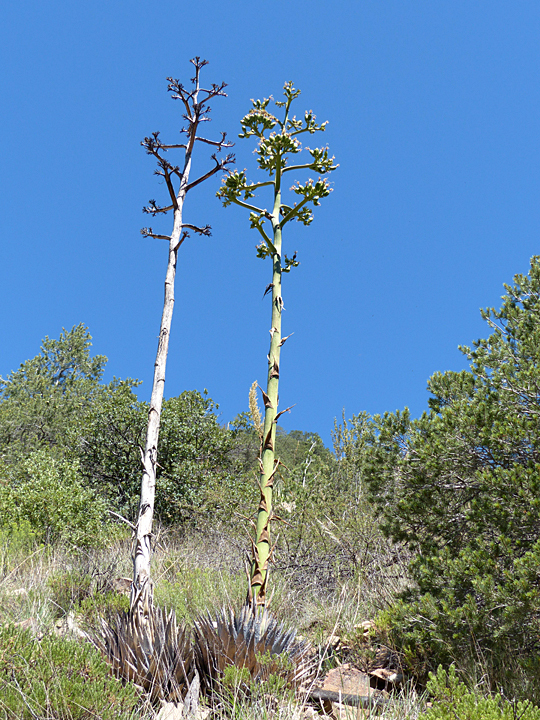 Like the plants, many of these species are found only within specific elevation ranges, which have been used to define several distinct ecosystems including the High Chihuahuan Desert Zone (4,500-5,000 feet), the Juniper and Pinon Pine Zone (5,000-6,500 feet), the Pine and Oak Zone (6,500-8,000 feet), the Fir and Aspen Zone (8,000-9,500 feet), and the Spruce and Fir Zone (9,500-11,000 feet). 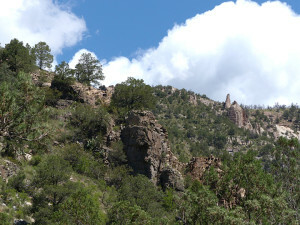 Archaeological evidence has shown that beginning with the earliest periods of habitation by the Southwest Archaic Culture, the southwest portion of the Gila Wilderness essentially functioned as Nature’s multi-level General Store for countless generations of New Mexican Native Americans right on up to the time of the final capture of the Apache Chief Geronimo in 1886. It is known that seasonal camps, as well as more permanent villages, existed along the southern front of the Mogollon Mountains on Sacaton Mesa wherever perennial streams flowed south from the high interior mountains to empty onto Sacaton Mesa. The canyons cut by these streams would have afforded the easiest and best trail routes and camping spots for foraging, hunting, and fishing at various levels within the Wilderness for at least eight months of the year, beginning in early Spring at the lowest elevations and gradually progressing to the highest elevations by late Fall. Without question, for the Native American people of Southern New Mexico, the Gila Wilderness General Store was the consummate food source, a multi-level store of unlimited variety, and one whose shelves were never empty. After descending about 400 feet in elevation from the trailhead down the west side of Rain Creek Canyon, the trail abruptly leaves the Alligator Juniper and Desert Scrub Oak zone and enters a narrow, 100-400 foot wide riparian forest that borders both sides of Rain Creek. This riparian forest consists of a diverse mix of deciduous and conifer trees, including Velvet Ash (Fraxinus velutina), Arizona Walnut (Juglans major), Rocky Mountain Maple (Acer glabrum), Blue Stem Willow (Salix irrorata), Emory Oak (Quercus emoryi), Netleaf Oak (Quercus rugosa), Arizona White Oak (Quercus arizonica), Alligator Juniper, Ponderosa Pine (Pinus scopulorum) and Douglas Fir (Pseudosuga menziesii), with a dense understory of numerous additional species of shrubs, grasses, and perennial and annual flowering plants. Immediately upstream from where the trail crosses the creek, a large Velvet Ash provides an idyllic, well-shaded spot for an early lunch or possibly just a short respite to refresh on the east bank of the Creek. To pause here for even a short time, especially around noon on a cloudless day, is to experience one of Nature’s Magical Places. For here, relaxing in the shade beneath the old tree, one soon notices an amazing rock formation on the opposite side of the Creek now resplendently lit by the high contrast light and deep shadow of the noon day Sun. 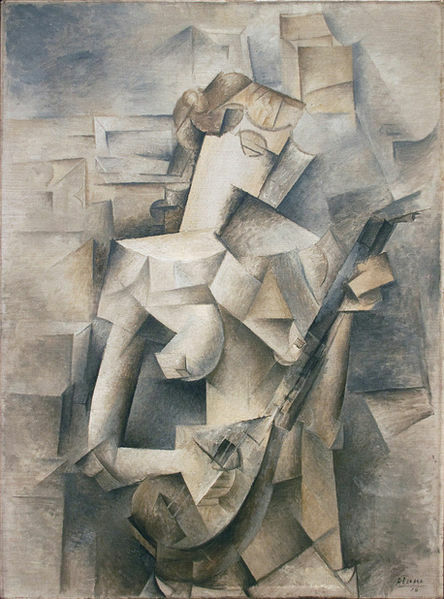 Geologically, one quickly recognizes the formation as an exceptional example of a highly-shattered, vertical wall of andesite that exhibits numerous, multi-directional, sharp angular joint planes before plunging into the creek. But on this day, there is much more present than that … here, in a magical moment, one realizes that they have entered one of Nature’s rare impromptu outdoor art galleries, and are now witnessing a most masterful exhibit of Nature’s stone sculpture, in this case, exquisitely executed in the style of the once avant-garde art movement known as Cubism. From the crossing spot, the Rain Creek Trail now leads upstream on the east side of the Creek. Numerous wildflowers abound along this section of the trail, their blossoms dancing in the shafts of bright sunlight filtering down through the dense canopy of dark green foliage overhead. 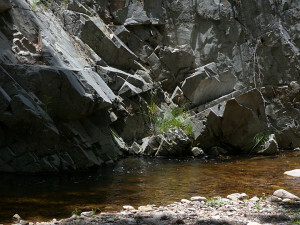 At about 0.3 of a mile from the crossing a sudden view of the creek at a bend in the trail reveals the presence of an inviting smooth bedrock water slide emptying into a deep pool of crystal clear water. A short investigation shows that here there is no easy access down to the pool, but, fortunately, good access exists just a short distance up the trail. From the pool overlook, the trail continues for another 0.1 of a mile along a relatively level ancient creek terrace about 40 feet above the creek before veering away to the east to begin the steep 850 foot climb up the east side of Rain Creek Canyon. Just to the west of where the trail veers to the east is a flat area that juts into the creek, which shows repeated use over the years as a favorite overnight camping spot for hikers making extended backpacking trips into the interior of the Wilderness. Large trees shade the central portion of the camping area making it a second lovey spot to rest and have lunch with easy access to the Creek about 20 feet below, and a short hike downstream along the creek to the rock water slide emptying into the deep pool seen earlier from the trail. Immediately to the north of the tree-sheltered lunch spot the tree and ground vegetation thins to reveal a magnificent view of the upper reaches of Rain Creek Canyon and the high mountains of the Mogollons beyond. On this day no attempt was made to begin the steep ascent of the east side of the Canyon, but instead terminated right where several old trail signs on trees mark the beginning of the ascent. It was time to return. Although the trip in had only covered 1.5 miles, it had taken about 2 hours including stops. While there would be fewer stops going back, the trip out still took another 2 hours, in part because of dawdling along the way taking photos, but also because of the required 400 foot ascent in elevation in the last mile before reaching the trailhead. 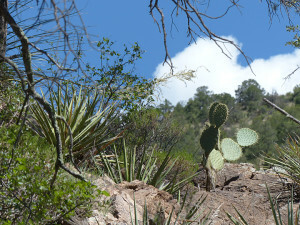 As always, it had been a wonderful day in the Gila! 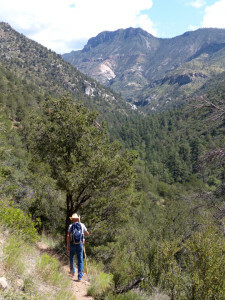 Unlike most day hikes into the Gila National Forest and Gila Wilderness which start at low elevations and end at higher elevations, this hike starts at an elevation of 6,200 feet and then immediately descends 400 feet in elevation to Rain Creek before beginning a slow climb upstream to the second lunch or rest stop at an elevation of 5,900 feet. Thus, the Rain Creek Trail is an easy to moderate hike in, which makes it tempting to go further and attempt the strenuous ascent of the steep switchbacks going up the east side of the Canyon. While the distance for ascending the east side of the Canyon is not prohibitive for a day hike, the physical and energy requirements are challenging. Thus, one might keep in mind how, at the end of a long day, the return climb out of the canyon has a way of somehow becoming twice as long and as steep as it did on the way in that morning! 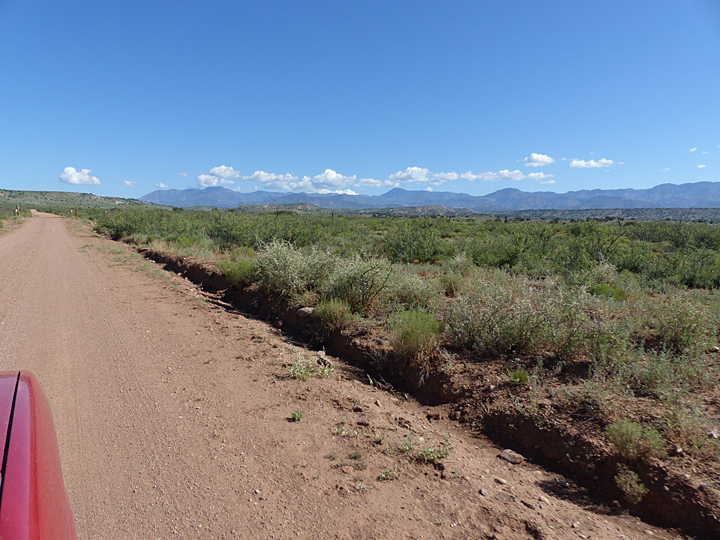 Normally, access to the Rain Creek Trailhead is excellent, lying only ¼ mile off Sacaton Road. Sacaton Road is, under normal conditions, a well maintained County Road. However, at certain times of the year, when there is significant and prolonged precipitation, portions of the road can become extremely muddy to becoming virtually impassable. Hence, visitors to the area are strongly advised to inquire locally before setting out on this hike. 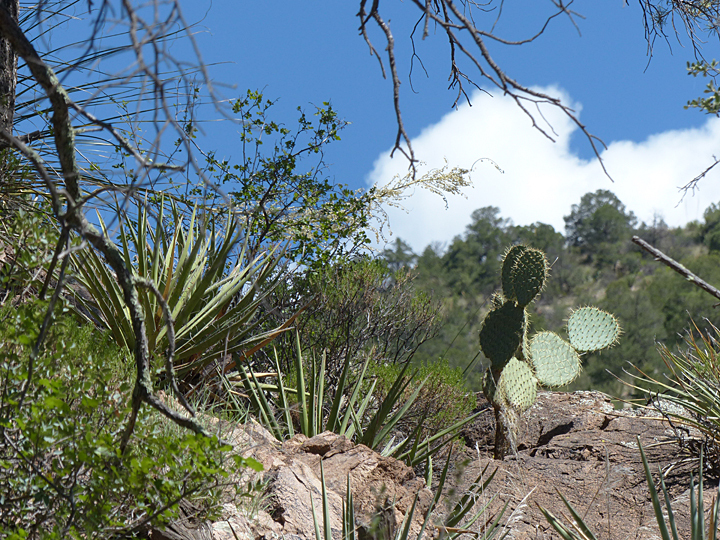 This entry was posted in Gila National Forest, Gila Wilderness, hiking and tagged Gila National Forest, Gila Wilderness, hiking, native plants, nature, nature walk. Bookmark the permalink.